Tucson felt like a righteous metropolis tonight as I honked my way through downtown, winding along Congress Street and Fourth Avenue. That’s what happens when you spend half the day in Sierra Vista. I’m covering Arizona’s Second Congressional District midterm election, so I felt it important to touch base with the Cochise County Republicans. Putting a face to the name helps in more situations than not. Plus I needed to get out of town—for perspective. Just before three, I took Speedway Boulevard west to Interstate 10 East, and at Benson it was Arizona State Route 90 South for about 30 miles. It’s a breathtaking drive. Twenty-three mph gusts toyed with my car. You could see 225 miles in each direction. I never imagined a barren landscape would enchant my soul. I cut through the desert, mainly flanked by pickup trucks. Plenty of beards and firepower here, I thought, while passing an oversized gun depot. These are good people. As a New Yorker, most of the country holds a surreal temperament and appears spacious, obtuse or oddly foreign. But we’re all our own pathetic stereotype, which provides an invaluable source of comedic relief. My unexpected arrival at the office interrupted Bible study. I was overdressed, which is fairly normal. Vera Hylsky, of at the Cochise County Republican Party, introduced herself and asked if she could help. We chatted for a few minutes, as I explained my motivation for dropping by. Maybe I should have called ahead, I thought. I’m glad I didn’t. I was looking for a volunteer who I spoke with three days earlier. She was out of the office. But I was offered her contact information and immediately rang her. No answer on either line. So I made myself comfortable and looked around the 30-foot square room. Running counterclockwise from the front door, the walls are littered with information about Republican politicians and candidates. First it was Trump/Pence, next was Rep. Martha McSally and as you moved through the space the candidates’ stature decreased in national importance. Hylsky explained she organized it this way for simplicity. At half passed four, the study group was wrapping up their conversation and birthday celebration—one of the five retirees was turning 90. I overheard them discussing the controversy surrounding Trump recognizing Jerusalem as Israel’s capital. Another topic at hand was the U.S. Customs and Border Protection. The details surrounding the latter were murky. I didn’t bother to ask, especially after Hylsky told her cohort I’m a reporter. As they left, we shared pleasantries and I was wished the best of luck with my article. Is there a liberal bias in the media, Hylsky asked, as we got to talking. The bias is dependent upon what your readership asks of you, I said, which was the easiest way to indirectly agree. There are more liberal-leaning newspaper though, she clarified. Of course, I replied. The real lost art is reporting hard facts, I furthered; everything is editorialized these days. Hylsky said her son, a former journalism major, has been saying that for years. This space made me uneasy, not because I disagree with Conservative politics, but this particular brand of rhetoric is foreign. It felt as if I walked into a church run by an unfamiliar denomination. We’re all “People of the Book” if we subscribe to politics—our saviors simply speak a different language. Have you seen an increase in people registering with the Republican party here in Cochise, I asked. Absolutely, Hylsky said without thinking twice. During the Presidential race, there was a large influx of Cochise County residents who registered with the GOP, she said; many were Democrats who were switching parties in order to place their protest vote. Wait, what? Please repeat that, I furthered. Democrats in Cochise County—who account for less than 27 percent of local registered voters—were joining the GOP because they were that averse to Hillary Clinton winning the election, I asked for clarification. Yes, said Hylsky. It was difficult to process this information in real time. Two things were clear: it took one question and roughly an hour to find out earth-shattering information about rural politics in Arizona. How many communities throughout the U.S. experienced this convulsion against a Clinton presidency, I thought. More important, why aren’t we reading stories like this? We rapped for a few more minutes, then it was quitting time for Hylsky. I decided to grab a sandwich from a local chain restaurant before leaving Sierra Vista. I scribbled a few notes, read bits of news and took time to enjoy my meal. The temperature plummeted as the sun set. I circled around town a taste, eventually weaving through Huachuca City. My attorney called while I was en route, insisting I stop at the Dusk Till Dawn Cabaret and ask for Bunny. That joint’s been closed for years, I jeered back at him. It’s a shame you took so long to leave your city, he said. Every morning I look for new music. Here are a few tunes that flavored my dreams and hopes this year —becoming the soundtrack of my reality. What does it really matter, I asked myself. Plenty of folks won’t cast a ballot in four days, my thoughts furthered. It’s Friday, Nov. 4, and it feels far from the precipice of a chilly weekend. 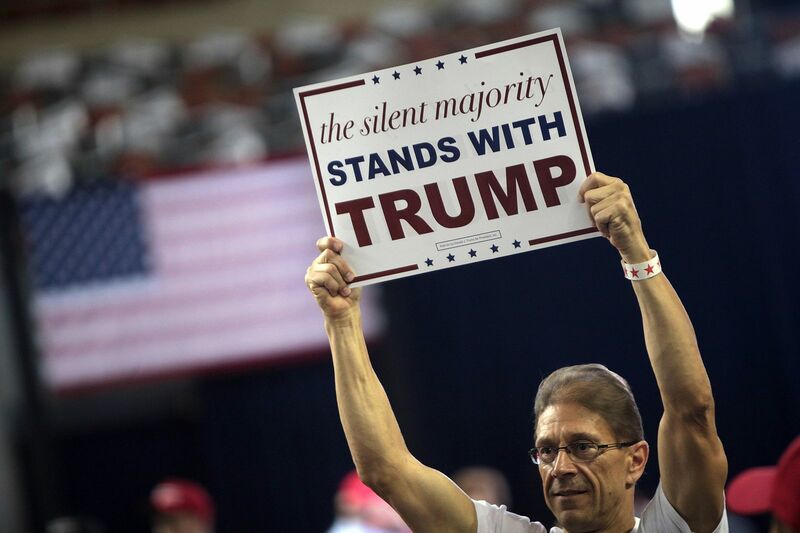 Presidential hopeful Donald J. Trump touts to his base in Hershey, Pennsylvania. The live broadcast by The Washington Post caught 104 viewers. Conversely, Fox News could brag about the 14,800 plus consumers glued to Trump’s rhetoric. And it’s hard to defend Hillary Clinton, or claim she’s a better choice. Clinton is business as usual; American politicians policing the world and destroying their home in the process. The contrast in numbers on these two competing news organizations says a lot. I was foolish enough to believe Trump was losing steam when I noticed how few were watching him via the Post. Then I came to, switched my feed to Fox, and enjoyed my hope disappear while sipping my glass of merlot. According to the Bipartisan Policy Center, on average, about 58.6 percent of Americans have bothered to vote in a presidential election since 2000. In 2012, a mere 57.5 percent of Americans cast a vote for president, which is a larger turnout than the 2000 race where only 54.2 percent elected their commander in chief. But our lives, and happiness, are our responsibility. No matter who wins this bloody election, and decides to devour this sad, egotistical country — we’re doomed. Most days I can only rationalize enough energy to hope we don’t get what we deserve. Overcast, 84 degrees. No breeze. Hot coffee, good tunes. Drifting through the fog of a fantastic, dreamy mood. Rain, or the hope thereof, gets me clear every time. Reprieve; let’s write. Then, the sprinkling begins. Creosote in the air. Humidity climbs. We should go on holiday, he thinks. But, just in town. A lovely, bitty jaunt away from our relentless summer months in Tucson. She’s magical, but life got in the way this afternoon. Can we dance tonight, babe, he asks. Either to remember or forget, your call, love. Two days before Super Tuesday — the most pivotal day for the presidential primaries in the United States — a pro-Bernie Sanders march took place in at least 40 cities nationwide without a single report from major news outlets. Although the group does not feign an objective voice, what does this alarming lack of coverage in large cities like New York, Boston and Los Angeles tell your average American citizen?
. @nytimes @BostonGlobe @PhillyInquirer @latimes @WSJ @washingtonpost @AP @FoxNews will y'all be covering the #marchforbernie ?If not, why? How can this type of national mobilization not be timely, or not effect the cities that are hosting these marches? By definition, the events taking place across the U.S., on Saturday, Feb. 27, are newsworthy, but where are our nation’s watchdogs, beat reporters or valiant champions of writing “All the News That’s Fit to Print”? A street lined with bustling markets in Beirut, Lebanon was rocked by two suicide bombers on Thursday, Nov. 12, killing 42 civilians. The following evening, Paris streets were sieged by three teams of ISIL attackers that left 129 people dead and 352 others wounded. Regarding the socially scarring human loss, both tragedies were equally horrific but many questioned the difference in coverage. Paris’ tragedy dominated the front page of The New York Times for three days, and from what I’ve read, for appropriate newsworthy reasons. Firstly, the City of Light was dimmed by an act of terrorism that was strategic and complicated in form. Also, this attack proved that ISIL could strike far outside its stronghold in the Middle East. David Uberti, of the Columbia Journalism Review, wrote the lopsided coverage last weekend should not be oversimplified, and Western frontpage treatment is ultimately weighted by “surprise, impact and resonance” regarding acts of terrorism. Frankly, Uberti is quite correct even though I begrudgingly agree with his points. But, this disproportional attention raises innumerable questions. Are we still blinded by the cultural ignorances we created with Orientalism? As journalists, how can we make the Middle East more relatable to American or Westernized societies? Can we realistically justify this type of asymmetrical news importance? And dare I ask, are we part of problem or can we, as an industry, become the change we wish to see? The professional journalists responsible for documenting unbiased history in real time apparently failed Beirut, maybe humanity at large, and further corroborated what’s past is prologue. The U.S. Centers for Disease Control and Prevention estimate there are about 780 million people worldwide that don’t have access to clean water or proper sanitation. As of January last year, on any given night there are about 578,424 homeless people in America, read the report from the U.S. Department of Housing and Urban Development. The National Sexual Violence Resource Center estimates one in five women will be raped at some point in their lives. Furthermore the CDC documented in 2010 alone, 4,828 young people between the ages of 10 and 24 were victims of homicide, which is about 13 deaths per day. And a coffee cup design can potentially ruin your Christmas? Click the crusty link below to get some full tilt Del Grande. 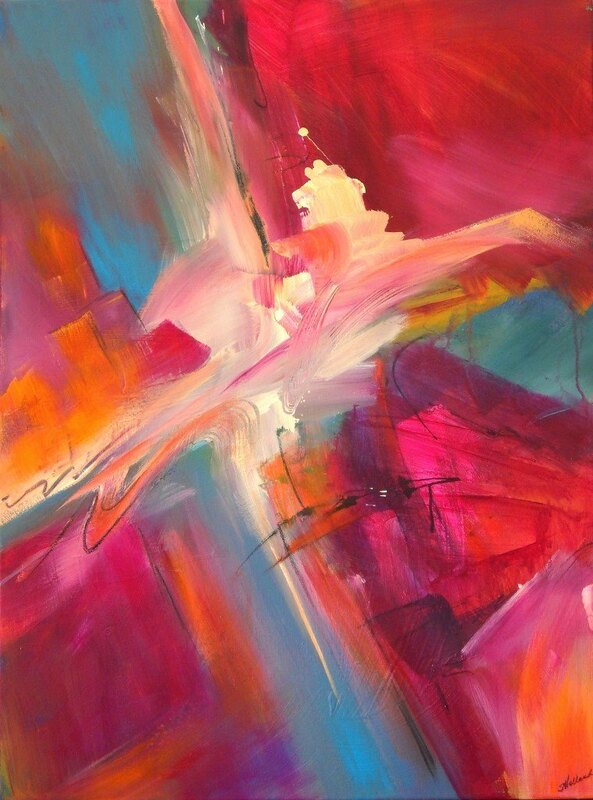 “Risking Delight” by Sheryl Holland. Used with permission. Abstract painter Sheryl Holland is a local auteur of emotive creation. She mixes paint on large palettes, and continues the visual blends upon the canvas. Holland’s big brushes swirl lakes of acrylic, then her eyes and mood begin working, she said. “Nothing to guide me but my eye; it’s ‘action painting’” Holland said. Her technique was derived from the infamous 1950s American expressionist, Jackson Pollock. Like Pollock, her process is emotive, intuitive but very conscience of composition and visual balance, she said. After graduating with a master’s degree in fine art from the University of Michigan, Holland taught art classes at a local high school. Now, Holland paints every day while enjoying her time in The Old Pueblo, she said. But Holland’s second career as a full-time artist is quite demanding and extremely rewarding. Holland will be showcasing her work during the Tucson Pima Arts Council Open Studio Tour on Nov. 14-15, at the Second Street gallery, located at 3025 E. Second St. The space is Holland’s second home since participating in the event for the past seven years. And the cozy, pop-up museum is housed in a friend’s backyard, she explained, with a warm laugh. Holland said one of her favorite paintings will be among the 50 pieces she has for sale. “Desert Walk” contains the colors she uses most, it displays a strong visual design and also evokes personal memories of living on the outskirts of town, she said. “It reminds me of the many walks that I’ve had,” Holland said. And while it’s great to make money that’s not her only motivation for having a show. For more information about Holland’s work visit her website here. And information about the Tucson Pima Arts Council Open Studio Tour can be found here.